Hazard: The gas valve in the recalled dryers can fail to shut off properly, continuing to heat the dryer and its contents after the drying cycle is complete. High temperatures inside and on the exterior surface of the dryers can scorch the drum, as well as burn or damage the dryer contents, posing a risk of burn, fire and smoke inhalation. Incidents/Injuries: LG Electronics and Sears have received 141 consumer complaints about dryers continuing to heat after the drying cycle is complete. There were three reports of minor burns to hands or arms. Burnt or scorched clothing was reported in more than 50 incidents. Description: LG Electronics and Sears’ Kenmore Elite brand gas dryers come in the following colors: LG models in white; Kenmore Elite® in red, white and ginger (gold). Model and serial numbers can be found on a label fixed to the front of the dryer above the opened door, which can be viewed only when the dryer door is open. To confirm if your dryer is part of this recall, identify both model and serial numbers, since not all dryers with the listed models are recalled. 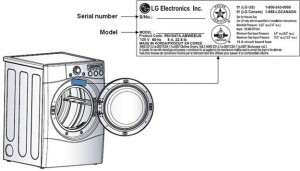 Sold by: LG Electronics brand gas dryers were sold by various appliance stores, including Sears, nationwide from November 2009 through August 2010. Kenmore Elite® brand gas dryers were sold at Sears stores nationwide from November 2009 through August 2010. 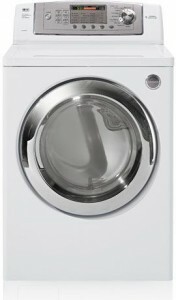 The approximate retail cost for the recalled dryers was between $650 and $1500 for these various models. Remedy: Consumers should turn off the gas supply and stop using the dryers until repaired. LG brand owners who purchased their dryer at retailers other than Sears should contact LG customer service to arrange for a free gas valve replacement. Customers who purchased Kenmore or LG brand dryers from Sears should contact Sears’ customer service to schedule a free repair to replace the gas valve. Some consumers have already been notified and have received the repair service. ATTENTION: Dryers that have a colored sticker on the back, top, or a colored sticker or a plus sign (“+”) on the back, bottom, near the gas valve assembly, have already been repaired. If accessible, consumers can check for these stickers or sign. If not accessible, contact LG or Sears as detailed below. LG Consumer Contact: For additional information about the recall and to schedule a repair, contact LG toll free at (866) 223-5355 between 8 a.m. and 7 p.m. CT Monday through Friday, and between 8 a.m. and 2 p.m. CT on Saturday, or visit the firm’s website at www.lg.com/us and click on Public Notices. Sears Consumer Contact: For additional information and to schedule a repair, contact Sears toll-free at (888) 375-9741 between 7 a.m. and 9 p.m. CT Monday through Friday, and between 7:00 A.M. and 6:00 P.M. Saturday, or visit the firm’s website at www.sears.com and click on Product Recalls under Customer Service.